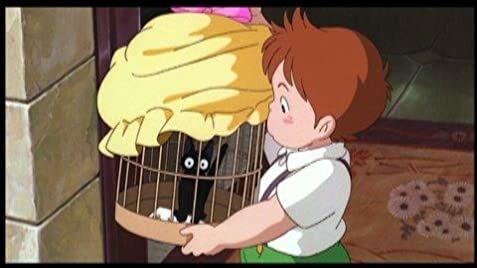 Kiki: [a flock of squawking crows approach to Kiki and Jiji] They're calling you an egg-stealer and you don't wanna know what else! If I were you I wouldn't go back down there, again. Jiji: We have to! Hold on! Having already been familiar with and a great admirer of some of Miyazaki's other Ghibli films, including Princess Mononoke, I turned to Kiki's Delivery Service on the recommendation of someone who suggested it as "light-hearted" fun. Being an eighteen-year-old male, I didn't think it would be much more than thata guilty pleasure to indulge in once in a while, something I could watch and then say, "Aw, what a cute film!" But Kiki's Delivery Service is so much more than "light-hearted fun." For one, it is a beautifully animated work of cinematic art, with Miyazaki's usual flair for gorgeous landscapes and astonishing detail. As in his recent films Princess Mononoke and Spirited Away, Miyazaki's brush paints a beautiful world. 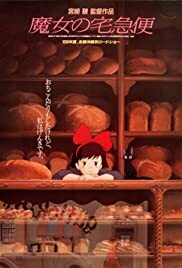 There is not much to be said about the plot itself: Kiki is a 13-year-old witch who has just left home to begin a year of training on her own, and she moves to a seaside European town, befriends a husband and wife baker, and sets up a flying delivery service. What sets Kiki's Delivery Service apart from many of Miyazaki's other works is the personal, rather than epic, nature of the story. It wonderfully captures the day-to-day life of an aspiring 13-year-old girl moving into the life of a bustling town. While there is plenty to please the thrill-seeking adventurous spirit, the film's real beauty lies in its ability to portray the more introverted aspects of life. Most Western animated cinema centers around loud, pop-influenced music and a bad-guy-fighting action-oriented plot, but Kiki's Delivery Service has a charming and understated musical score, and lacks a traditional antagonist. Life isn't all excitement and fighting bad guyssomething that this film seems to get across more than any Disney, Pixar, Fox, or other Western animated film I've ever seen. In fact, the doldrums of life are what form the heart of this film, as Kiki finds that she begins to lose her witch's abilities and can no longer fly. Kiki's Delivery Service is a masterpiece, one of my all-time favorite films, and Kiki's search for the heart within herself is a tale that adults may appreciate more than their children. Indeed, Kiki is one of the most appealing characters that Miyazaki ever brought to life, which is certainly saying something. One of Miyazaki's great arts is in never talking down to his audience, and this fantastic story is no exception. 131 of 140 people found this review helpful. Was this review helpful to you?